"LIFE'S TWISTS & TURNS IN THE NORTHERN FOREST!" 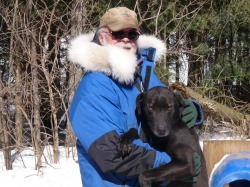 The thing with a Musher's life is you never know what Mother Nature has in store. That is part of what happened this week! We were right on our race preparation schedule & then Mother Nature threw us a curve with the forecast of very warm weather for the race weekend. The temperature in our estimation was too warm (+8 to +9) to race dogs & the original mileage, as of Thursday Morning , for the Open Race was 16 miles each day (2 day race). We found out on Saturday morning they had changed the distance to 11 miles each day. By that time, we had already cancelled our motel reservations. However, we feel we still made the right decision, for our team, not to run in these warm temperatures. It was disappointing not to attend the race as we felt our team was very well prepared. However, it was a great learning experience to follow the tutoring of Laurent Gonsolin on the training, pairing of the team members and the feeding program to prepare the dogs weight for their optimum performance. I will be better prepared for next season's races. Now that our racing season is finished, it is time to get Michele & Ben some experience running teams of their own. To-date, they both have had two runs & did great. This is also that time of the year to reflect upon the season & finish making plans for next season. There is one piece of the equation awaiting to be finalized & I will make the announcement when completed. It will make for a very exciting Summer anticipating the start of Fall Training! There is a new video of last Tuesday's run on the Lake posted on the Training Page. Also, I have 5 dogs available for adoption as I have to reduce the size of the kennel making room for the puppies.